Sky high gas bills, uncontrollable road rage, unpleasant body odors on packed trains: The many downsides of commuting are well-documented and already constitute a solid argument in favor of opting to work remotely. But a recent study out of Lund University in Sweden offers another reason to trade your train pass for a home office: Your commute is bad for your health. The study tracked 21,000 full-time employees in Sweden aged between 18 and 65, comparing their health and asking about their method of commuting and sleep and stress levels, as well as tracking how many days they missed work. The results indicate that taking a car, train or bus to the office is likely to negatively impact your health. “Generally car and public transport users suffered more everyday stress, poorer sleep quality, exhaustion and, on a seven point scale, felt that they struggled with their health compared to the active commuters,” like cyclists, said Researcher Erik Hansson. The longer the commute, the worse the effects. We know that people who have a lot of demands and very little control over how they meet those demands are at a higher risk for negative health effects. And when you’re relying on a train to get to work, it’s totally out of your control most of the time. This is entirely in line with existing science we’ve covered previously on WWD, which shows lack of autonomy is linked to higher stress, which, in turn, correlates with worse health. Flexible and self-directed, new ways of working that are web enabled and location independent, boost autonomy and so should also boost health. And if you’re still on the fence about approaching your boss about ditching your commute, the grim math about how much your commute is daily journey is costing you might spur your courage and get you into her office. At Net:Work, we’ll explore the benefits — and challenges — of an increasingly mobile workforce. The event will be held in San Francisco on Dec. 8. Image courtesy of Flickr user Ben Woosley. 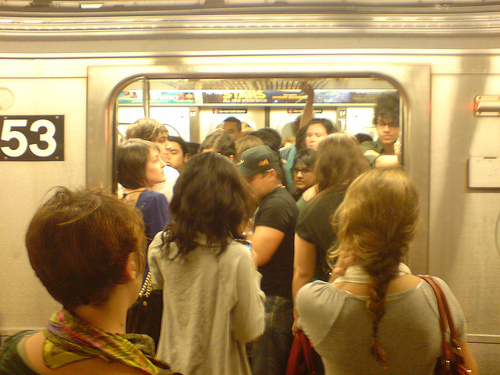 Another reason to work remotely: Commuting is killing you http://t.co/kAIj1nqB RT @goodridge: :-) <-HEAR HEAR!